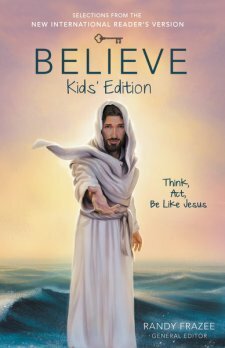 Believe Kids’ Edition by Randy Frazee is a devotional that explains how the Bible is not just stories but that the Bible is to be used as a “blueprint for living” Believe Kids’ Edition by Randy Frazee contains 30 devotions divided into three sections: Think, Act and Be. These three sections answer the questions: What do I believe?, What should I do? and Who am I becoming? I like the New International Reader’s Version because its not a paraphrased story, it is actual scripture. I like the uniform layout of each devotion. Each devotion has five sections. The Keys section which focuses on the key question, the key idea and the key verse. Think About It section talks about the belief that is being discussed and its importance. Introduction section sets up the Scripture guiding the reader. 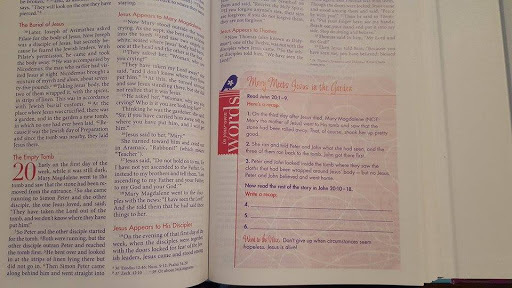 Core Truths section is in blue text focusing on the Scripture and why that particular Scripture was chosen to answer the question asked. Discussion Question section is at the end of each devotion to help kids dive more into the Scripture and how the Bible impacts out lives. The cover is beautiful and immediately draws the reader in to learn about Jesus. The font and illustrations are simple and easy on the reader’s eyes. As I read Believe Kids’ Edition by Randy Frazee I was personally drawn to read it to my own children and I strongly recommend it to anyone looking for a family devotional that is strongly grounded on Biblical truth. 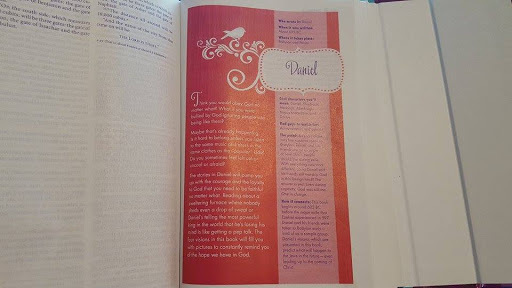 The NIV Zondervan Study Bible, featuring Dr. D.A. Carson as general editor, is built on the truth of Scripture and centered on the gospel message. D.A. Carson is research professor of New Testament at Trinity Evangelical Divinity School in Deerfield, Illinois. He is a founding member of the Gospel Coalition. 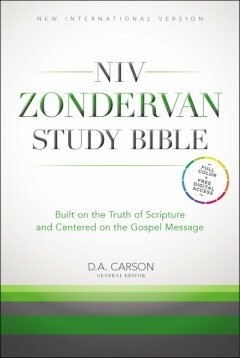 The NIV Zondervan Study Bible, featuring Dr. D.A. Carson as general editor, is built on the truth of Scripture and centered on the gospel message. 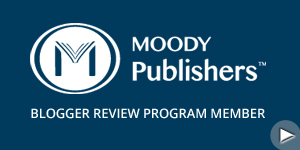 An ambitious and comprehensive undertaking, Dr. Carson, with committee members Dr. T. Desmond Alexander, Dr. Richard S. Hess, Dr. Douglas J. Moo, and Dr. Andrew David Naselli, along with a team of over 60 contributors from a wide range of evangelical denominations and perspectives, crafted all-new study notes and other study tools to present a biblical theology of God’s special revelation in the Scriptures. To further aid the readers’ understanding of the Bible, also included are full-color maps, charts, photos and diagrams. In addition, a single-column setting of the Bible text provides maximum readability. The NIV Zondervan Study Bible is a thick book. It has 2880 pages. When I received it in the mail I was actually overwhelmed for a moment because I was not expecting the large size. But as I opened The NIV Zondervan Study Bible and began to look at it I was very amazed with the content. The NIV Zondervan Study Bible is full of pictures, maps, illustrations and charts. Much more than I have seen in any other version. The study notes and cross reference system gives something to explore on every page. Each book begins with an extensive introduction and outline. It is very evident that there was much time spent in creating this study Bible. Even if the NIV isn’t your preferred version, you would benefit to have The NIV Zondervan Study Bible in your home library. I like how they separated the articles from the main Cannon of the Bible. The free digital version is very handy to take to church because of the size of this book. The Amish are admired for their simple lives, their intricate quilts, their bold faith, and especially their homemade meals. Straight from the heart of Amish country, this new collection of hearty, wholesome recipes will remind you of the pleasures of the family table. The thing that fascinates me about the Amish community is their simplicity. 99 Favorite Amish Recipes by Georgia Varozza is a book that is just that… Simple, basic and reliable. 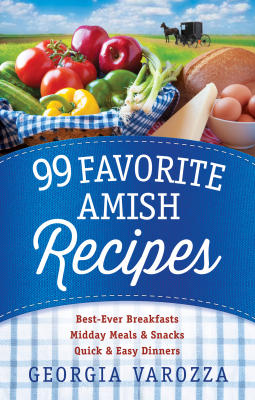 Recipes featured in 99 Favorite Amish Recipes by Georgia Varozza include 32 breakfasts, 35 midday meals and snacks, quick and 32 easy dinners. I love the scripture throughout the book. Recipes today with the help of the internet can be overwhelming and complex just from the amount available. Many people say that you don’t need recipe books because the internet is today’s recipe book but I disagree. While the internet is nice, having a recipe book in print in the kitchen is still valuable today. The recipes in 99 Favorite Amish Recipes by Georgia Varozza are very easy to follow and have sparked many new favorites in my own family kitchen. I would highly recommend this book to anyone who is looking for reliable recipes for their family or who likes the Amish culture. Adventuring Through the Bible: A Comprehensive Guide to the Entire Bible by Ray C. Stedman is just as the title says, A Comprehensive Guide to the Entire Bible. This book is an incredible reference to go along with any biblical study. This book goes beyond my wildest expectations of what a Bible guide should be. The table of contents is very well organized and very helpful to navigate though the book. The pictures, maps and charts are beautiful. The outlines are the most comprehensive that I’ve seen. I highly suggest this book to anyone who studies the Bible. This book is perfect for students if they are in grade school through seminary. 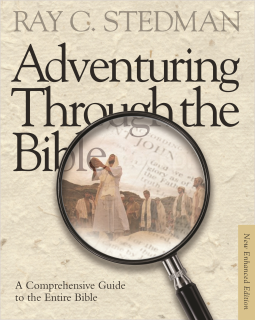 Adventuring Through the Bible by Ray C. Stedman is a valuable resource not to be overlooked. This special binding of the Faithgirlz! Bible, NIV offers a trendy and unique magnetic closure. Every girl wants to know she’s totally unique and special. This Bible says that with Faithgirlz! sparkle. Through the many in-text features found only in the Faithgirlz! Bible, NIV girls will grow closer to God as they discover the journey of a lifetime. • Book introductions—Read about the who, when, where, and what of each book. • Dream Girl—Use your imagination to put yourself in the story. • Bring It On!—Take quizzes to really get to know yourself. • Is There a Little (Eve, Ruth, Isaiah) in You?—See for yourself what you have in common. 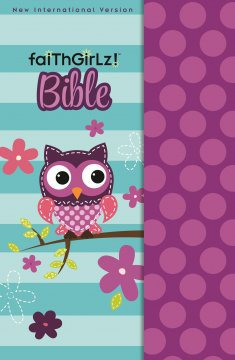 • Words to Live By—Check out these Bible verses that are great for memorizing. • What Happens Next?—Create a list of events to tell a Bible story in your own words. • Oh, I Get It!—Find answers to Bible questions you’ve wondered about. • The complete New International Version (NIV). • Features written by bestselling author and tween expert Nancy Rue. What drew me to this book was the pink and purple font. 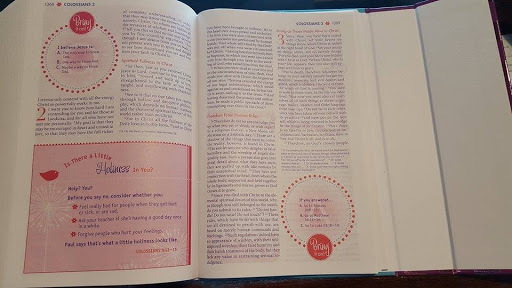 I wished they put Jesus’ words in pink or red, but this book is a great NIV Bible from preteen through teen. I love the reference sections in the back including a weights and measurements section, which can be very useful for understanding the way measurement was standard in the Bible. 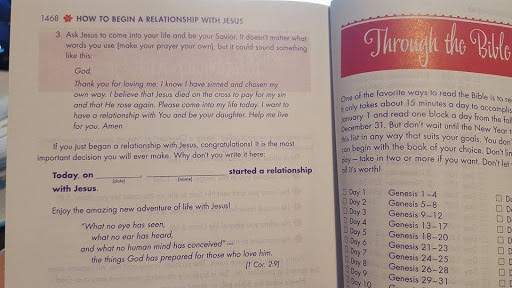 How to begin a relationship with Jesus section is a nice keepsake for new believers. 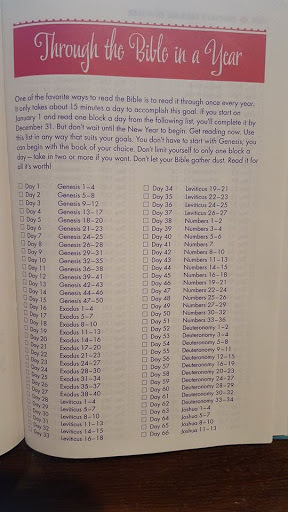 The through the Bible in a year section, is a great reference for keeping track of the great goal of reading through the Bible. The Promises from the Bible and Perspectives from the Bible section helps teens with tough issues from a biblical a perspective. The notes section gives a few pages to write notes or start a reference section. The magnetic enclosure is a nice feature for a new Bible but I wonder how it will close if any journaling or papers were added over time. There is no name section in the beginning but lots of blank space to make your own name and dedication section. 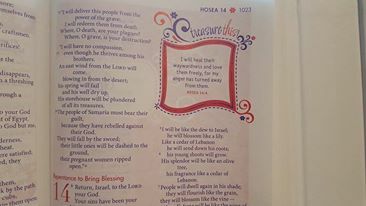 Overall I like this Bible and my preteen daughters love it. 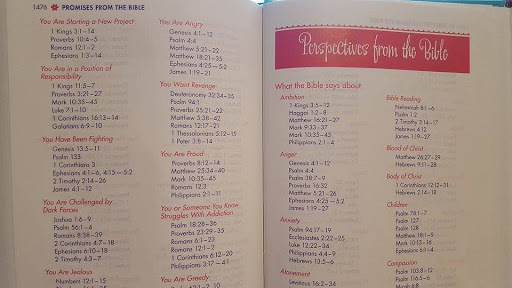 I would recommend this Bible to anyone has a teen or preteen daughter.